Istanbul's bright yellow taxis, ubiquitous and perennially honking for custom, appear ingrained in the daily life of the Turkish metropolis. But could the fast-growing ride sharing app Uber make them a thing of the past? Uber has enjoyed soaring popularity in Istanbul, where users appreciate the cashless payment system, security and convenience of hailing a cab by phone. But, as in several other European cities, this has stoked antagonism with official taxi drivers, who have brought legal cases in Istanbul in a bid to have the app blocked in Turkey. Tensions have also spilt over into violence, with Uber drivers complaining of being verbally harassed, beaten up or even shot at. Kemal Kuru, an Uber driver since last year, said he was cornered and beaten by a group as he set off for a concert hall in the Sisli district last month on a job. "I went to pick up a customer around midnight but someone blocked the road and harassed me verbally," he told AFP. "I got out of the car and all of a sudden 10 people attacked me... My teeth were broken and my lip was split." Kuru said the assailants could not be immediately identified as they fled into the darkness. But he pointed the finger at taxi drivers. "I believe our income is getting on their nerves and they think we are stealing their customers." In March, shots were fired at an Uber vehicle in Istanbul's Kucukcekmece district. The driver escaped unhurt. Uber drivers say they are easily targeted as the vans they generally drive are unusual in the city. But representatives of official taxi companies condemn such accusations—widely publicised in the Turkish media—as a stunt to discredit their business. Eyup Aksu, head of the main taxi drivers' association in Istanbul, accused Uber of launching a "publicity campaign" in an attempt to influence the pending legal cases. "Taxi drivers have never resorted to violence against Uber. This is a smear campaign to blacken the reputation of taxis," he told AFP in his Istanbul office. 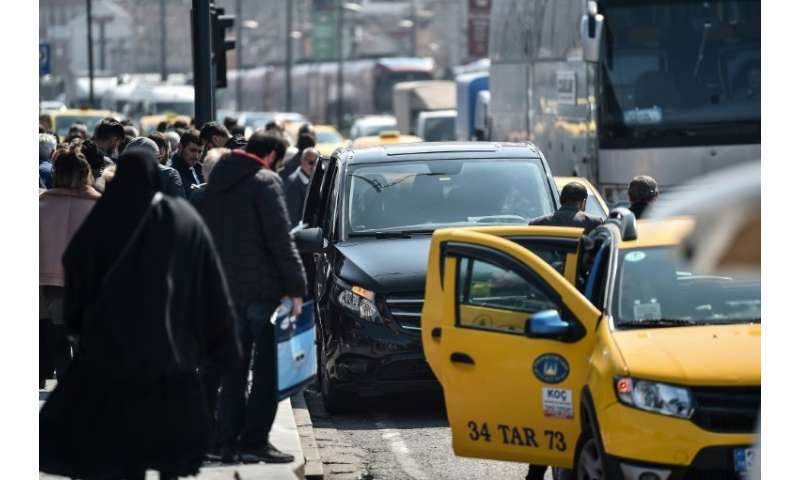 There are almost 17,400 official yellow taxis in Istanbul, providing an essential and relatively affordable service in a gigantic city where public transport often falls short. But as new competitors like Uber have emerged, the official taxis have often failed to keep pace with changing times and society. They have been slow to implement systems to pay by card, install panic buttons that help female passengers in particular feel more secure and are only now considering lights to indicate if the cab is occupied or free. In a bid to trump Uber, Istanbul taxis are themselves now becoming part of a digital network called iTaksi that allows passengers to order them from their phone. Aksu admitted some deficiencies in the taxi sector but said taxis were transforming to catch up with Uber's standards. "We are shifting to luxurious taxi transport. We now have VIP transport in some touristic places and airports," he said. Meanwhile horror taxi stories abound in Istanbul—not just from incredulous tourists but also exasperated locals—about being over-charged, driven a circuitous route to ramp up the metre or being given fake change. In a well publicised case, an Istanbul court this month handed a taxi driver a suspended jail term for having taken a Saudi passenger on an epic city tour rather than to the airport as requested. But Istanbul taxi drivers insist they are working hard to make an honest living from a tough business where margins were already tight and now squeezed further by Uber's presence. Taxi drivers rent their car from the owner of the licence, whose cost of 1.5 million lira (300,000 euros, $370,000) is well beyond most drivers. The number of licence plates available for taxis has stayed stable as the city's population boomed, driving up their price. Taxi driver Burhan Yuksek, looking for passengers in the busy waterside Eminonu district, said his business is suffering "hugely" because of Uber. "I work by a hotel. We used to receive 40-50 calls daily from the hotel and currently it has dropped to 15-20," he said. "They are pirates. They are stealing our labour and bread." Taxi drivers feel they have political backing, with President Recep Tayyip Erdogan regularly pictured drinking tea with the taxi community. In the bigger of two legal actions brought by taxi drivers' associations against Uber, an Istanbul court is due to resume hearing the case on June 4. In London where its drivers number around 40,000, Uber lost its licence over its approach to reporting serious criminal offences and its criminal record checks for drivers. But it is allowed to operate in the British capital pending an appeal set for later this year. Uber also put a temporary halt to its self-driving car programme in the United States after an accident involving one of its cars near Phoenix killed a pedestrian. In service for three years in Turkey, Uber has 5,000 vehicles and 8,000 drivers in Istanbul. Vedat Kaya, of the Tourism and Development Platform, said Uber represented a "revolt against the taxi monopoly", adding that some 4,500 taxi drivers had already switched to work with Uber. Former taxi driver Yavuz Sarac, who joined Uber last summer, says he did it after realising he would not own his own business "no matter if I work for 150 years". "Uber has presented new opportunities. I've owned my business," he said, complaining that taxi drivers were exploited by the plate owners, while the Uber licence was much less costly. "I earn a living for my family. To me, it is a kind of escape from slavery to freedom."